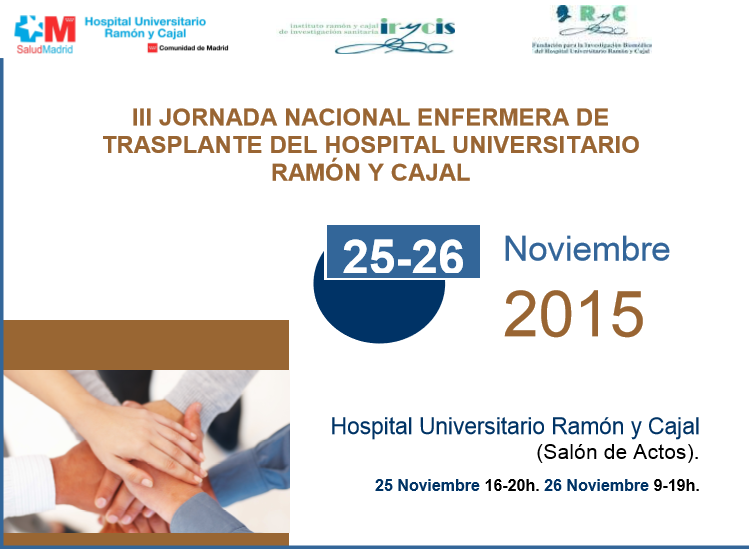 Next November 25th and 26th will take place the 3rd National Transplant Nursing Conference (info only available in Spanish) at the Hospital Universitario Ramón y Cajal. November 26th at 15:00, we are going to talk about the humanization of the process of donation and transplantation, a topic moderated by Gema Marmisa (Nurse at Regional Office for the Coordination of Transplant) and Raquel Nieto (President of Lung Transplant Organization of Madrid), who already visited this blog last May to talk about her work from the room E008. •The patient perspective: D. Fernando Moreno Pizarro. Actor. Transplanted lung. One more time, it´s a true honour and a pleasure for us to share such important Conference with all attendees. And very special for me, a date for nostalgia: I will return to the Ramon y Cajal, the Hospital where I began to study Medicine, one of the places where I started my own adventure. See you in the “Pira”! Don´t miss it!